Eva-dry - Edv-2200 : Dehumidifier Review • The Air Geeks, reviews of air conditioners, dehumidifiers and air purifiers. 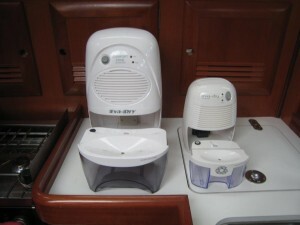 Are you looking for a small dehumidifier for your bathroom, laundry room or boat? The Eva-dry Edv-2200 is a compact and light humidity control system that is based on the Peltier Technology. This unit measures 6.8 x 8.5 x 14 inches and weighs 6.6 pounds. In addition, this dehumidifier consumes minimum energy. The Edv-2200 offers low dehumidification capacity and it is therefore suitable for small spaces. It effectively pulls moistures from the air to create a comfortable dry environment. If your house has mold and mildew, then this could be a suitable solution. Considering that you could be interested in this dehumidifier, we have gathered information on its features, strengths and drawbacks to enable you to make a wise decision. Thanks for your interest in the Air Geeks’ reviews and let’s see what the EDV-2200 is worth! Unlike most dehumidifiers in the market today, the Eva-dry Edv-2200 is based on the Peltier technology. We will not bore you here with the technical details, but what it means, as a result, is that it is small in size and light as compared to compressor-based units. In addition, it comes with a 4-pint tank for holding the captured water. Depending on the relative humidity of your room, this unit may go for a couple of days before it fills the tank. Questions, ladies and gentlemen? Is the Edv-2200 suitable for a large room? Truthfully, no. This humidity control system pulls moisture from the air at a relatively low rate. It is therefore suitable for small spaces that are likely to have low amounts of moisture. For users who have placed this unit in a bathroom, it fills the tank after around 2 days when the relative humidity is very high. After running the unit for some days, the relative humidity drops and they can stay for up to 7 days without the need to empty it. Does this unit offer the continuous drain option? Well, no again! This unit does not offer the continuous drain option. It lacks a provision for attaching a hose like most dehumidifiers in the market today. The user therefore needs to empty the tank manually. However, some users have improvised ways of attaching the hose to avoid the cumbersome task of emptying the tank. This improvisation involves drilling a hole on the unit to attach a hose. You should be careful when attempting this to avoid breaking the unit. For us, this is kind of a deal breaker for large rooms. Does the unit alert the user when the reservoir is full? Yes… fortunately! This dehumidifier has an indicator to alert the user when the bucket is full. If the user is not available to empty the tank immediately, the unit shuts off automatically. You therefore don’t need to worry that the unit will flood your bedroom, bathroom, or boat in your absence. Like most appliances, dehumidifiers produce sound that can be disturbing depending on where it is placed. The Edv-2200 does not produce loud sound and is quieter than most compressor-based units of same or lower capacity. In addition, it runs efficiently and dissipates virtually unnoticeable amount of heat to the environment. As such, this humidity control system is unlikely to cause a rise in the temperature of your room. Nevertheless, we have observed that its power adapter becomes hot when the unit is left running for a long time. Quiet operation. This dehumidifier is quieter than most compressor-based units. It can therefore be used in a small bedroom without creating disturbances. Low energy needs. Even when used continuously, this 72 W unit cannot create a noticeable spike in your energy consumption pattern. Does not heat your room. Unlike most dehumidifiers, this unit cannot make the temperature of your room to rise. The change is virtually unnoticeable. Small tank. Although the Edv-2200 is a low capacity unit, it comes with a very small tank. The 4-pint tank fills quickly in high humidity places. No provision for attaching a hose. If you intend to drain the captured water to a sink via a hose, then this unit is not a suitable option for you. Weak fan. The fan is not powerful enough to blow a lot of air. I have purchased two of these Eva-Dry EDV-2200 solid state Peltier dehumidifiers over a period of 14 months, and now, about 17 months after having purchased the first one, I can state that I am very satisfied with the performance of each of them; I also own one of the EDV-2200's smaller cousins, the EVA-Dry EDV-1100 (now in its 17 month of full-time service), and am satisfied with its performance as well. Incidentally, I own several small wall-mounted digital humidity meters, aka hygrometers, and these devices, when one of them is mounted in a room or space treated by one of the Eva-Dry EDV-2200 dehumidifiers, graphically demonstrate, via the rapidly-dropping humidity percentage reading, how effectively these small Peltier effect dehumidifiers work! Certain rooms in our house get damp at many times of the year, and so I decided, about 18 months ago, to purchase a dehumidifier for each of these spaces. When reviewing available dehumidifiers, I quickly came to the conclusion that I did NOT wish to purchase an old-style mecahnical compressor-style dehumidifier, the type that uses a motor and a compressor, and I decided that rather, I wanted to purchase only a Peltier effect dehumidifier, since there are no moving parts in it other than the small 12VDC muffin fan that moves the air. Being an electronics engineer, I was also aware that Peltier effect devices (the active component that removes the moisture from the air), which are solid-state and contain no moving parts, can easily last for anywhere from 10 to 30 years, or longer, trouble-free." I purchased this product about a month ago, and since then have been running it a good bit. It takes moisture out of the air to the tune of about half the reservoir per day, which is pretty interesting since I didn't know there was so much water to remove. That being said, I again don't know whether that is good or bad, or if the moisture isn't just as quickly replaced by outside factors. I use this dehumidifier in my bedroom, as I live in a very muggy/humid climate, and as far as I can tell it does in fact make a reasonable difference in the overall feel of the air in my room. The dimensions of my bedroom plus bathroom suite are approx 20x12x15' and 8x6x15' (high ceilings) joined. The area has three full length windows plus a door leading to the rest of the apartment, so it's never sealed like a painted-shut-window or weather-sealed setup would be. It rained pretty hard the last couple of days, and normally in a room like this you'd feel a little on the drenched side while sleeping, but I was definitely a bit more comfortable than that. Not perfect mind you, but then again this isn't one of those $300 units either. I would recommend this for light usage, but not necessarily in an area like mine that's just going to stay pretty humid no matter what you might do to dry it out." The Eva-dry Edv-2200 is a low capacity unit that is suitable for small spaces such as small bedrooms, offices, boats and bathrooms. This unit consumes minimum energy and does not dissipate noticeable amounts of heat. Unlike most dehumidifiers in the market today, this unit does not offer a provision for attaching a hose. This means that the unit cannot run without requiring your regular attention. Furthermore, this dehumidifier comes with a small tank. This is a big drawback considering that the user cannot use a hose. If you are looking for a dehumidifier for a small space and you don’t mind emptying the tank from time to time, then this is a suitable unit for you. It is cheap ($110) and consumes little amounts of power.